Tedlar®PVF Gas Sampling Bags are constructed of 2-mil thick Tedlar® with solid seam to keep gases contained. Tedlar® film is polyvinyl fluoride (PVF) film produced by DUPONT USA. In the late 1970s SKC USA used Tedlar film to make gas sampling bags for the first time, Tedlar® PVF is strong, durable, and considered chemically inert to a wide range of compounds. Tedlar gas sampling bag can be used in high precision PPM level analysis sampling, can sample and save all kinds of corrosive gas and liquid samples, the heat-resistance temperature of Tedlar is 150℃～170℃. For over 30 years, the SKC USA constantly promoted Tedlar to make users all around the world generally accepted Tedlar gas sampling bags and approved by USA EPA. 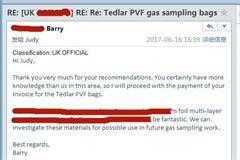 At present Tedlar gas sampling bags are also recommended in domestic. 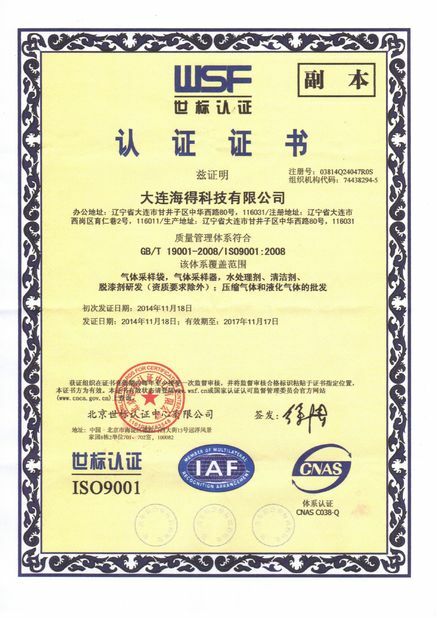 In recent years, country environmental regulations are increasingly strict, detection business of testing institutions detecting organic volatile residue for cars, household goods and other products of civilian use is also increasing. Our company can customize large size Tedlar Sampling Bags, which can reach 3000MM, volume 6000L, trilateral edge sealing side and one side sealed with straight rod clamp(3m)(as shown below), used to solid VOCs residual detection. Such as automobile engine, automotive parts, household items pollution detection. Tedlar gas sampling bags are accredited by regulatory agencies in different countries and widely used indoor air sampling, waste processing yard gas sampling, soil sampling and other environmental protection application. Our Tedlar sampling bags come with renovated, patented valves. The materials of the valves are Polycarbonate(PC) or Polytetrafluoroethylene(PTFE) or Polypropylene(PP); Depending on inlet orientation, there are two types of valves: one type is that the inlet in vertical to the film, the other one type is the inlet horizontal to the film, both valves have the same functionalities: has on/off function; has a sample cap with septum inside for syringe sampling purpose, both valves are easy to use. One advantage of horizontal valve(side opening) is touse less storage space. Standard Tedlar Gas Sampling Bag Sizes: 0.5L, 1L, 2L, 3L, 4L, 5L, 8L, 10L, 15L, 20L, 30L, 40L～6000L or customized size. Select from a variety of sizes to suit your needs. Buy More Save More ! Excellent chemical resistance, corrosion resistance, organic solvent resistance, and low adsorption. The water vapor osmotic quantity of Tedlar film is 13g/m2.24h.0.1MPa; and oxygen osmotic quantity is 114cc/m2.24h.0.1MPa (the data is measured value not guarantee value). 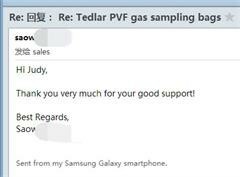 Gas barrier property of Tedlar PVF film is superior to Teflon FEP film. Less permeable than FEP, Kynar PVDF and Fluode. Bags resist puncture in the field. Less expensive than FEP and Kynar PVDF film. Recommended in many EPA testing methods. Tedlar® PVF film is strong, durable, and considered chemically inert to a wide range of compounds. Tedlar gas sampling bag can be used in high precsion PPM level analysis sampling, can sample and save all kinds of corrosive gas and liquid samples, and used to solid VOCs residual detection. Inflation pressure: Avoid filling pressure higher than 6000Pa. Fill gas until the bag is fully expanded, however, it is not so tense when you press it using your finger. Operating temperature: Working temperatures should be -60°C to +150°C for PTFE connector and -20°C to +80°C for PC stopcock valve . Storage and use: Keep away from flame and high temperature when filling and storage. Avoid contacting sharp stuff. 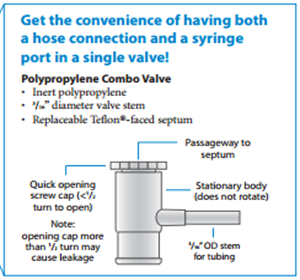 Gas exchanging: Before use, flush sampling bags three times with the gas you want to fill. Needle sampling: When using a needle to draw gas from highly elastic septum, squeeze the septum with fingers in order to restore the sealing property after pulling out the needle. The sample gas in sampling bag to save time should not be too long, specific saving time depend on detection limit of experimental analysis requirement,gas component species,temperature and humidity,pressure, etc: generally, for pure inert gas, sampling bag can be used as a temporary storage container and recommended storage time less than 72 hours; for standard gas,flue gas,ambient atmosphere, recommended storage time less than 24 hours. The gas sampling bag should be cleaned repeatedly replacement if it is reused. Suggest the same sample bag collecting samples of the same kind gas, don't mix. High purity nitrogen gas heating replacement can reduce the interference of organic deposition. Avoid filling pressure higher than 6000Pa, fill gas until the bag is fully expanded, however, it is not so tense when you press it using your finger.The overpressure filling can cause gas sampling bag burst damage. When sampling and cleaning, please do not exceed 80% of the calibration volume, take 1L sampling bag for example, suggest sampling volume is less than 0.8 L.
Exclusive and unique solution can be provided to our customer by our well-trained and professional engineers and staffs.